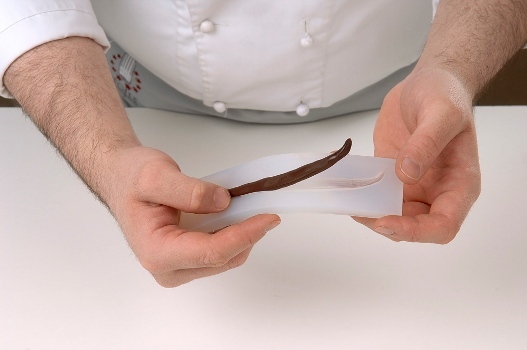 Silicone mold accumulates the heat that the tempered chocolate, releases. Therefore, during a production cycle, between one and another demoulding, we recommend storing the silicone mold in a blast chiller or in the refrigerator for a few minutes to cool it. Make sure before using it again, that the silicone mold has a lower temperature than the chocolate. In this way, the demoulding of the subjects will be always easy, the chocolate will be crystallized properly and your silicone molds will remain clean. The silicone mold accumulates the heat that the tempered chocolate releases. Therefore, during a production cycle, between a demoulding and another, we recommend storing the silicone mold in a blast chiller or in the refrigerator for a few minutes to cool it. Before using it again, make sure that the silicone mold has a lower temperature than the chocolate. In this way, the demoulding of the subjects will always be easy, the chocolate will be crystallized properly and your silicone molds will remain clean.